Don’t miss this fantastic lineup of 20 comedians performing at the Hanover Street Comedy Sundowners at GrandWest on Sunday, 2 December 2018. Each comedian will get five minutes to blow the audience away in an evening filled with action packed laughter. There will be a mix of experienced comics and newcomers dishing out the punch lines with the host Dalin Oliver driving the show. 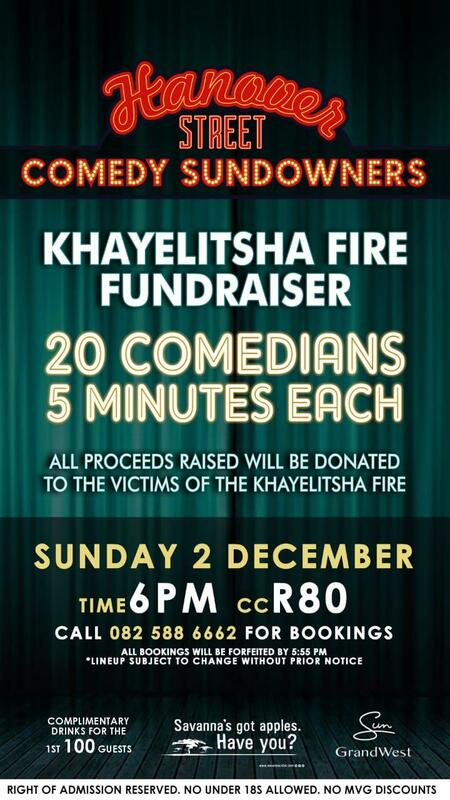 All proceeds of this event will go to the Khayelitsha Fire Relief. Please bring food, clothing and stationery donations on the night. Tickets cost R80 per person, call 082 588 6662 to book. Show starts at 18h00.